From the ripe old age of 16, driving is a symbol of independence here in the United States. While access to the driver’s seat provides individuals with the freedom to get to and from a variety of activities, deciding when a senior should stop driving can be far more challenging than knowing when a teenager is ready to start. When it comes to safe senior driving, some elderly Americans are comfortable and competent behind the wheel well into their nineties, while others leave driving behind in far earlier years due to medical complications or cognitive impairment that makes driving more dangerous. 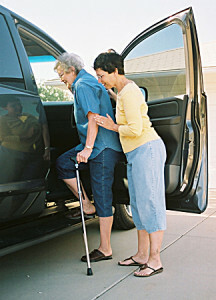 For seniors who do choose to step back from driving responsibilities, transportation can become a major concern. Public Transportation: Many municipalities provide special transportation for seniors. Set routes may offer discounted or free fares for senior riders, or specialized routes may drop off and pick up at popular senior stops, such as grocery stores, pharmacies and the senior center. Senior Transport Services: In a growing number of areas, senior transport services offer senior-friendly vehicles (such as busses with low loading ports or wheelchair access) that can be arranged on a pre-set schedule or with short notice via a simple phone call. These services are typically low-cost and transport for caregivers is often also available, making this a great option for seniors traveling with a family member or caregiver dispatched from a home care agency that uses a home care software or home care system to manage its caregivers. Caregiver Assistance: Home care agencies that use a home care software or home care system, such as ClearCare Online, to manage their care services can easily provide seniors with a caregiver capable of assisting with driving. Based on specific client needs, ClearCare Online home care software and home care system can help match seniors with caregivers who are capable of driving, have their own car or are comfortable driving a client’s car. Additionally, with the assistance of a home care software or home care system, home care administrators can schedule clients on a schedule that coincides with both care and transportation needs. While driving can be a sensitive topic for senior citizens, having an array of transportation options other than self-transport can help soften the change when driving is no longer safe. And with the help of a home care agency using a home care software or home care system, transportation can be arranged to meet nearly any need.